Today Universal Studios made it official the AMC’s The Walking Dead will come to life at Universal Studio’s Halloween Horror Nights in Orlando and Hollywood. If you read our forums and the Halloween Horror Nights 22 Speculation thread, this has been a rumor for some time now. 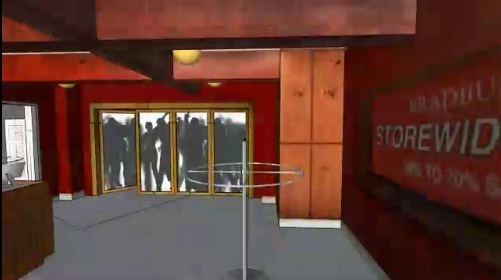 Most of us expected this to be announced at Comic-Con during The Walking Dead panel, but it wasn’t only to get the Silent Hill announcement the next day. The Golden Globe-nominated, Emmy Award-winning series The Walking Dead is based on the comic book written by Robert Kirkman and published by Image Comics. The series tells the story of the months and years that follow after a zombie apocalypse. It follows a group of survivors, led by police officer Rick Grimes, who travel in search of a safe and secure home. The Walking Dead is the number-one drama series in basic cable history for adults 18-49 and adults 25-54. Universal Studios’ Halloween creative teams are working with AMC and The Walking Dead to create an authentic experience that is true to the Emmy Award-winning hit series. 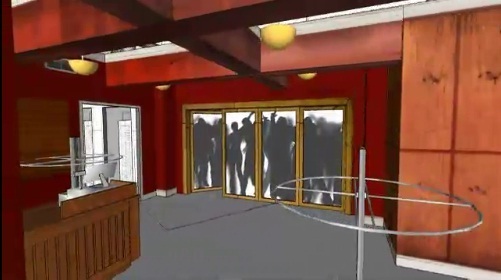 The haunted mazes on both coasts feature eerily authentic, elaborately designed, movie-quality sets that include some of the most iconic locations and scenes from the show. Mobs of undead walkers bring to “life” the vicious, hungry, zombies from the show. “The collaboration with Universal Studios’ creative teams is a fantastic cross-promotional opportunity and a great way to capture the spirit of the series, which makes its Season 3 debut on AMC this October,” said Linda Schupack, AMC’s executive vice president of marketing. 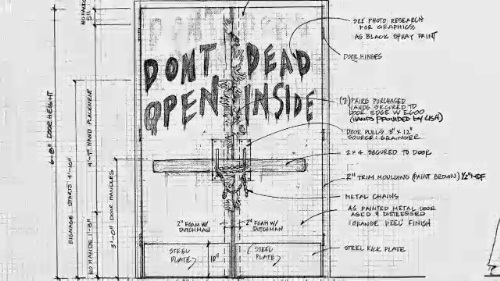 During the video below, some concept artwork was shown including the “Don’t Open Dead Inside” door in the hospital from the pilot show (Season 1, Episode 1).